And the negative effects of childhood obesity can last well into adulthood, with increased risks of developing pre-diabetes and early onset of other cardiovascular diseases. 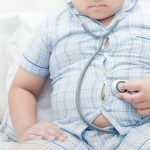 They concluded that childhood obesity predicts the risk of adult adiposity, which is associated with an increased risk of early onset adult atherosclerotic CVD (ACVD) as measured by carotid intima media thickness – hypertension, stroke, ischaemic heart disease and pre-diabetes. Researchers also observed that while BMI is an adequate predictor of pre-diabetes and increased carotid intima media thickness, it was a weak predictor of hypertension and ACVD. Furthermore, although BMI is a popular measurement, other measurements like waist circumference and skinfold thickness were considered more predictive. However, the message remains clear – reducing childhood obesity should be a priority for healthcare policy makers. And at a time when there are severe pressures on the NHS, tackling childhood obesity is an area where substantial disease prevention is attainable.